Modern technology has come a long way. Today’s emerging organizations manage client relations and information in various ways. Startups may use Google sheets as CRM in the early stages. However, with the growth of business and increasing customer base, a dedicated CRM tool becomes necessity. 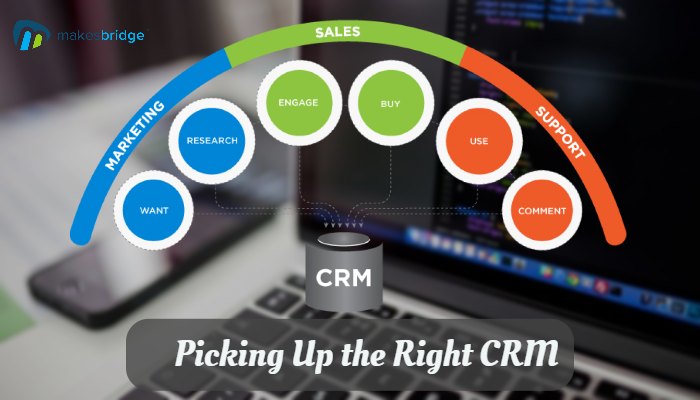 On this front making the right decision becomes a complex job as there are a number of CRM solutions available; hence, finding the one that works best for your emerging business can be a challenge. Before you choose a CRM solution for your business, you have to focus precisely on what you need from a CRM system. What you want from a CRM system will be determined by who you are and what you do. You might need the ability to have your call center agents open an account speedily, or you may need demographic and family data for your marketing department to finish deals and product tracking. Despite your objectives, you need to be familiar with precisely what you need before you choose a vendor or you will end up with a system that is not good for your business. The rule is to list down your needs, requirements, and specifications of the platform. Consult your sales and marketing team to ensure making the right decision. It helps you avoid many problems associated with automated marketing and selling process. 2. Can It Grow Along With You? Growth and expansion are the essentials for a successful business – the CRM that you pick needs to have similar qualities. Choosing a system with flexibility and the capacity to grow along with your business implies that the investment you’ll be making right now is one that will work for the future as well. If you choose the right program, it won’t be necessary to execute another CRM in the future if your business exceeds its available system. This can be done by reading some software reviews, comparison posts, or some word of mouth consultancy. The purpose is to measure the platform’s perceived ability to scale with your business. This is what we’ve learnt at Makesbridge that marketing and sales platforms are valuable only if they can scale with the business growth. Implementing any sort of new system is rarely a simple process. Finding a CRM that can adjust or improve the existing structure of your business is of great importance. Many organizations lead their work on various applications like Microsoft Outlook, Sage accounting packages and many other Google applications. However, the question should be: “Is the new CRM ready to integrate these projects into its system?” Change is a challenge for many of us, so picking a CRM that suits as many current processes as possible suggests that the change will be smooth, streamlined and simple on your team. Another aspect of the same is to measure its ability to integrate with your marketing automation system. You’ve to send out newsletter, emails, and important announcements to customers and prospects. This is what we proudly tell our customers at Makesbridge. Our marketing automation platform offers tight integration with Salesforce, Netsuite, Highrise, Google, LinkedIn and others. You can important the contacts and do all essential prospect management tasks without any trouble. Choosing a CRM system that addresses most of your needs in a simple way is not easy. More than likely you may not be able to find all that you need from any vendor, and you will be forced to take a look at your customization choices. Be wary. Don’t fall into the trap of endless customization. When you choose a system, you want one that enables you to perform assignments with the use of internal staff so that you aren’t required to pay someone outside of your organization to get a report each time. Here again, the purpose is to set the software/platform’s features as per your daily business needs. Ah, the budget. This is something that everybody needs to remember each and every day. In spite of the fact that it is not difficult to avoid talking about the budget, it will consistently be a concern when you are choosing a CRM system. The good news is that there are CRM systems out there that will meet any budgetary needs you have, whether they are reserved for short-term solutions or can be extended to long-term views. We hope the given suggestions will help you make the right choice and pick up the platform that suits your needs. If you want to send us your feedback, or share any idea; follow Makesbridge on Twitter, LinkedIn, or Facebook.